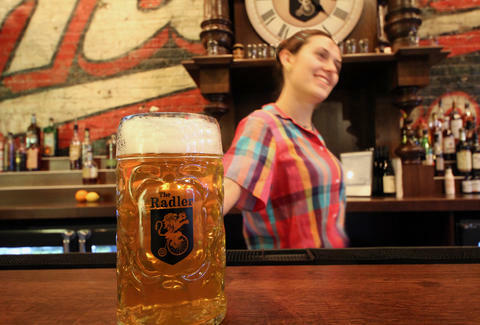 Raise a glass, diligent Thrillist reader who 'Likes' every story they read, because you're gonna want to 'Prost' the crap out of this: The Radler -- a bohemian beer hall where you can eat and drink like a Visigoth, without all the senseless plundering -- is now open for business in Logan Square. 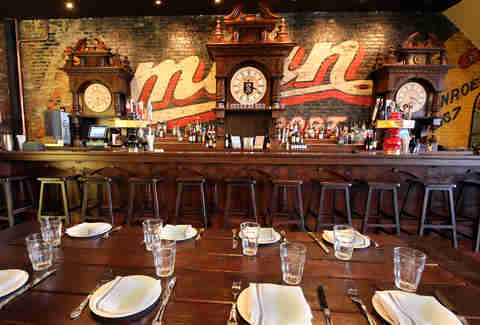 Inside the 170-seat space, you’ll find custom-carved furniture and a cuckoo-clock bar, behind which is a 120yr-old mural from the now-defunct Bohemian Brewing company which was discovered during demolition and Kickstarted to preserve. The Radler is the first (and lederhosen-iest) upstart restaurant in a soon-to-be bombarded Milwaukee Avenue block, with projects in the works like Chicago Distilling Company (see: Chicago Distillery Guide), a bar from Scofflaw, and a bakery from Mindy Segal of Mindy's Hot Chocolate (and cinnamon sugar donuts). 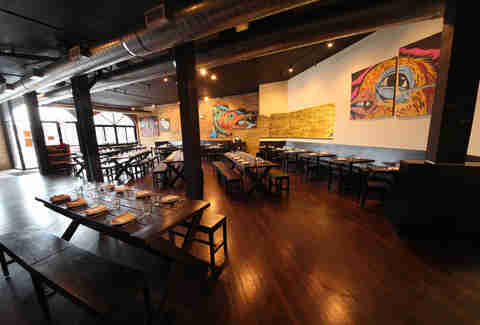 The food menu is a spread of contemporary German eats like braised rabbit, veal schnitzel in mulled pinot noir, and a pretzel with malt butter and blackberry jam. 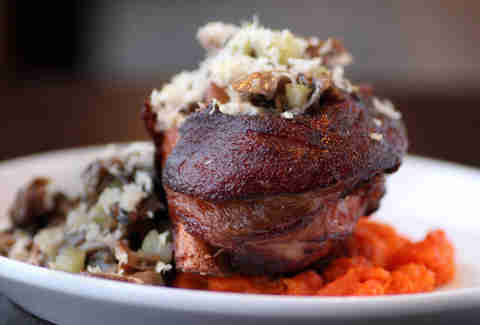 Chef Nathan Sears (Vie, two-time Baconfest Award winner) also knows his way around pork, as seen with this deep-fried ham hock with a crispy, smoky skin. You’ll also wanna dive into their spread of haus (!) sausages: grilled Thuringer, poached Weisswurst with curry-roasted apples, smoked knockwurst with fried sunchokes, and this seared boar-wurst with caramelized onions and cocoa nib relish. There’re 16 beers available on draft, split between locals (Spiteful, Atlas, Begyle) and a mix of German/Austrian/Czech imports. 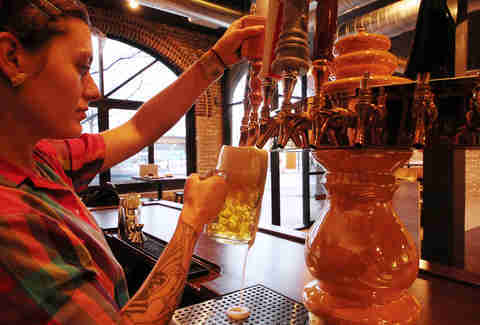 The Haus Helles, brewed by Flesk in Lombard, IL and poured by this bartender with awesome tattoos, is one of a handful of sessionable lagers you can get by the liter. 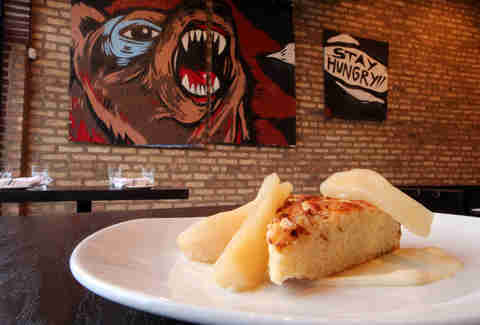 Cap off your ferocious hunger with a slice of bee sting cake (roasted pear, thousands of angry bees and wheat beer syrup), and take note of the street art murals from Joseph Sentrock Perez of neighboring Galerie F. You might remember these: they were done on The Radler's boarded up windows during construction.